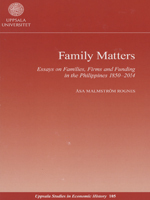 Family Matters – Essays of Families, Firms and Funding in the Philippines 1850–2014 is a study of family business groups in the Philippines. It consists of an introductory essay and four separate papers. The introductory essay frames the thesis in the vast literature on family firms and family business groups in emerging economies, discusses sources and methodology, and provides an overview of Philippine economic history to give the overarching economic context to the separate papers. The first paper deals with the role of institutions in understanding the dominance and prevalence of family business groups in the Philippines. The literature posits that weak institutions can help explain the predominance of family business groups in emerging economies. This paper takes a historical perspective to examine whether that explanation holds over time, examining the development of core property rights and core economic institutions over time and how family firms have responded. The second paper studies funding options in the late nineteenth and early twentieth centuries and whether the rapidly growing financial system was driven from above or below. The paper examines the impact it had on the explicit goal of stimulating investment and growth in the early twentieth century and what that meant for family firms. The third paper studies capital market developments since the Asian crisis and in particular the growth of the corporate bond market in the Philippines; how this development and how it affected family business groups. The fourth paper deals with governance and management capabilities and examines professionalization of family firms over time to seek to answer the question of longevity. Management literature provides studies and models for family firms but these are fairly recent whereas the family firms that have been in business for several generations have found ways to manage for the long term. The paper analyses what three select groups have done in terms of professionalization and management.